Come along with cousins Justin and Adam on an adventure of a lifetime! 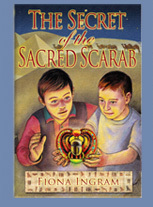 The Secret of the Sacred Scarab is the story of two adventurous boys who accompany their aunt to Eygpt. Both Justin and Adam are familiar with the work of James Kinnaird, an archaeologist who is searching for the legendary tomb of an ancient Egyptian ruler, the Scarab King. Unknown to the boys, a scruffy street peddler drops an ancient scarab into Adam’s pocket. Dr. Khalid, head of the department of antiquities and research at the Eygptian Museum, expresses great interest in the boys and their discovered relic. Khalid is also heading up an investigation into a smuggling ring that has been carrying ancient artifacts out of the country. When James Kinnaird is reported missing and presumed dead, Adam and Justin know something sinister is afoot. Their lives now in constant danger, the boys continue to investigate the mysterious scarab in their possession, knowing that someone will do whatever it takes to get their hands on it. Can the boys solve the mystery of the sacred scarab and save James Kinnaird before time runs out? What a fabulous first book in a planned series from Fiona Ingram. In The Secret of the Sacred Scarab, readers are introduced to adventurous and ingenious cousins Adam and Justin, lovers of history and interested in all sorts of neat artifacts. The boys are allowed to join their aunt’s trip to Egypt provided they each write a paper about their discoveries for school. Little did they know what they would find in Egypt. Ingram immediately draws the reader in as Justin and Adam are quickly pulled into the mystery surrounding the secret scarab thanks to the scruffy street peddler they meet when they first land in Eygpt. Never ones to shy away from an adventure, the boys begin their investigation in earnest after meeting the strange and evil looking Dr. Khalid. There are very few valleys in this book, it’s truly a non-stop adventure story, and one that boys and girls alike will enjoy. One of the neat aspects of the book is to see how the boys’ relationships with their aunt and other adults in the story evolve: the immediate and growing tension between the boys and Dr. Khalid, Aunt Isabel attempting to be the responsible adult by not overly encouraging their adventures while at the same time not wanting to squash their natural curiosity and interest of Egypt; Gran’s desire to protect the boys and the many others I can’t reveal without giving away too much of the plot. Once I started reading The Secret of the Sacred Scarab I never wanted to put it down, and I was ready to read it all over again as soon as I was done. If the first book in The Chronicle of the Stone series by Fiona Ingram is this superb, I hold out high hopes for future installments. I eagerly anticipate Book 2 in the series, The Search for the Stone of Excalibur!